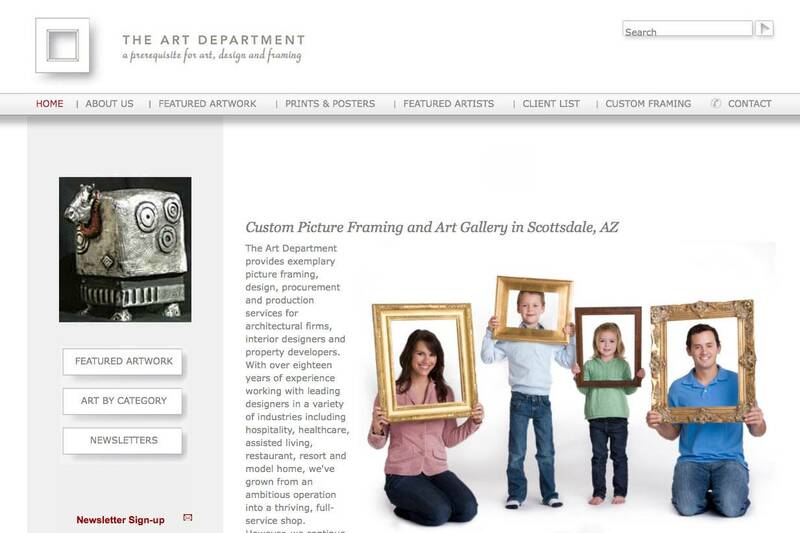 John Winchell privately owns a fine art dealership known as The Art Department, in Scottsdale, Arizona. He has developed a solid niche in high end Scottsdale markets in the areas of both residential and commercial artistic design, customized framing, repair, and mounting. The Art Department provides custom artworks for golf courses, private residence, area hotels, and other organizations. Their website has been designed with clean aesthetics with the requirement for flawless social connectivity with users. This website showcases available artwork, quality of the craftsmanship and products, and general pricing models. Using TYPO3 Content Management Systems, John is now able to take full control of all content including regular promotions, email blasts, social media integrations, and inventive recommendations. Nearly all of the photography on the website is customized professional photography showcasing artwork; however a few stock photographs also are included.